After reaching the last 16 of the Europa League, Borussia Dortmund played host to 2nd-bottom Hoffenheim idho have recently gone under the leadership of the youngest head coach in Bundesliga history – 28-year-old Julian Nagelsmann. The away team looked far better than their league position suggested and until the red card (as well as during periods at 10 men) were more than a match for Dortmund. Tuchel’s side again showed some staleness in their game though his mid-game adaptions as well as the Hoffenheim red card brought about a late comeback for the 2nd placed team. Sahin made his Bundesliga comeback and started alongside Weigl in a 4-2-3-1 formation. 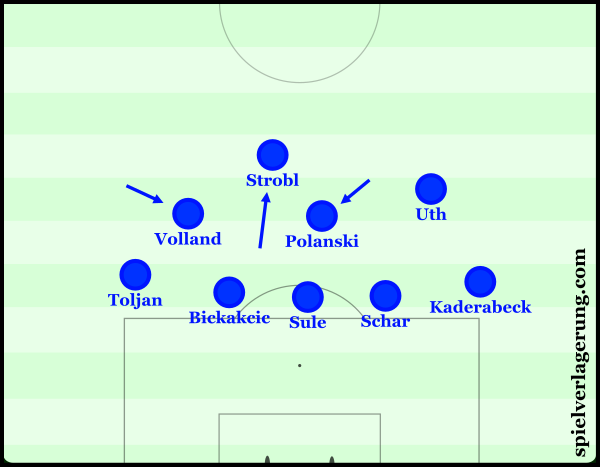 Nagelsmann again used a 5-2-1-2 formation which throughout the game was strong, particularly in defence where they contained an albeit weak Dortmund well. Changes were made to both side’s shapes during the game whether they were forced or unforced, in what was an interesting match from a tactical and strategical perspective. The away side looked to press quite high up in their 5-2-1-2 shape and restrict Dortmund’s ability to construct possession, as a few teams have done in recent games. This strategy makes sense considering that the 2nd placed side have been somewhat toothless in possession over the past weeks and Hoffenheim worked well up for large periods of the game. 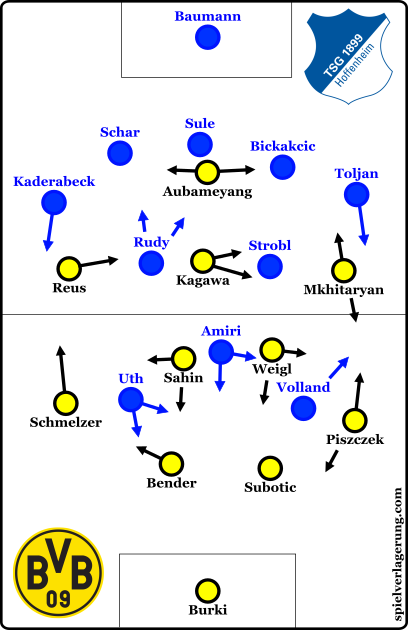 As the central Amiri pushed up and created a three-chain in the first line of pressure, Hoffenheim played high up and stopped Dortmund from playing through the centre and restricting their access to Sahin and Weigl. They were rather man-oriented which was particularly evident between Rudy and Strobl, who would situationally base their positioning on Kagawa and Reus when he moved inside. With Dortmund in a 3-2 shape in build-up, the front three of Hoffenheim were positioned intelligently to cover the passing options and stop Dortmund from building centrally. Amiri would generally position himself between Sahin and Weigl and slightly orient himself to the ball-near Dortmund 6 for access and to restrict BVB’s access to him. Meanwhile, the two wider forwards would use cover shadows to block the diagonal passes into the sixes and force Dortmund either back into the middle or into a wider area. Between the three of them, this was an effective tactic to force Dortmund wider which then created the potential to isolate a player like Piszczek in a trap. By restricting Dortmund’s ability to make diagonal passes towards the centre, they could generally either build through the wing, which in their current shape could be isolated easily against the touchline or move the ball back into Subotic in the centre. Unlike Hummels, the returning centre-back has weak playmaking skills and furthermore, any vertical passes into the two pivots could be easily dealt with. This is because they would usually receive the ball with their back to goal and due to the instant pressure of the front three would generally be contained to a simple pass back. Also impressive was Hoffenheim’s game in possession. They generally looked to make short-to-medium ranged build-up and circulated the ball intelligently against Dortmund’s press. In particular they were impressive in their penetrative passes from deep which were used to break Dortmund’s press on a number of occasions. Hoffenheim’s front three opening space for each other. Nagelsmann’s side were generally making break-throughs in the wider areas of the pitch, where the advanced full-backs could be accessed as well as one of the forwards in their common dropping movements into the half-spaces. A significant feature of their building game was the clever movement of the front three. Each of the front line were active off of the ball and would intelligently move to open spaces for each other in midfield which would allow them to receive passes from the deeper Hoffenheim players which could break multiple lines of Dortmund pressure. These mechanisms were effective considering Dortmund’s man-oriented nature and could drag the pivots out of position quite effectively. Given their distance to the ball, it could be suggested that Sahin and Weigl were positioned too closely to their man and adapted to match their movements too much as well. Tuchel again lined his side up in a 4-2-3-1 formation with another strong selection. Gündogan was rested to the bench and Hummels too was given a break after a congested fixture list. During build-up, they structured themselves with the same 3-chain as Piszczek stayed deeper whilst his opposite full-back Marcel Schmelzer moved much higher and stretched on the left wing. Bender moved towards the left half-space whilst Subotic stayed centrally and the three of them formed the first line of Dortmund players. Although this has provided some protection against counter-attacks, which was a weakness of Dortmund’s particularly towards the end of the first half of the season, it has not been wholly effective. Mkhitaryan has often been moved to the right wing where he cannot utilise the full potential of his skillset whilst the build-up suffers with Piszczek open to being targeted by opposition. This 3-chain resulted in Dortmund playing what appeared to be a W-M formation. 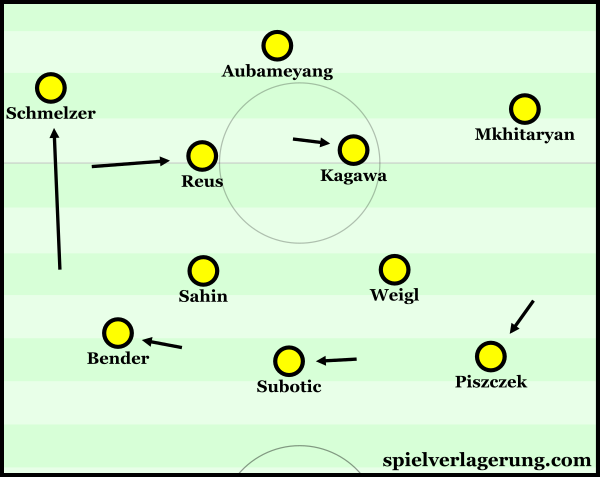 With Schmelzer high on the left, Reus came inside and played closer to Kagawa whilst Weigl and Sahin were positioned in front of the defensive line. 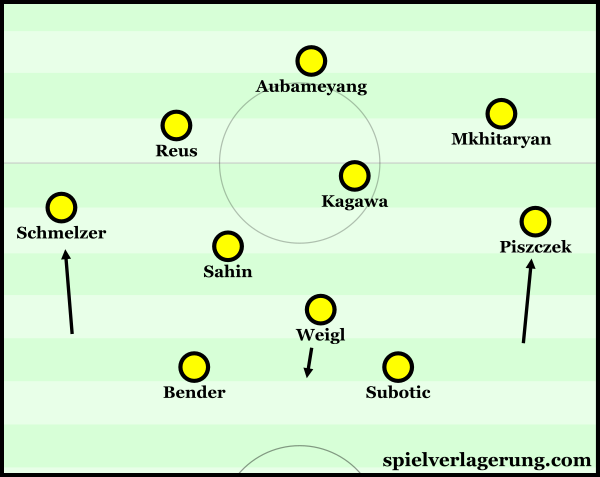 Schmelzer and Mkhitaryan stretched the shape whilst Aubameyang acted at the top. As opposed to their previous left half-space focus, Dortmund moved the ball more down the right of the pitch in this game, as Hoffenheim often tried to force them towards Piszczek’s side. From these spaces, Kagawa made a lot of movements through the right half-space in support whilst Weigl too was present. Mkhitaryan made some dropping movements to provide another passing option though his positioning on the pitch limited what he could do with the ball. The Armenian only managed to progress the ball in a few of these moments, aside from a couple of other cases where he showed his needle-playing ability and dribbled the ball towards the centre of the pitch. There were also some interesting rotations between Kagawa and Reus, who was perhaps more centrally-oriented than when I have seen him in recent other games. Said switches seemed to be in relation to the ball circulation, as the two would swap when Dortmund looked to move the ball through the left of the pitch. By acting closer to the left half-space, Kagawa could offer himself better and support in progressing the ball upfield whilst Reus on the right could be used to greater effect if they manage to break the ball through into open space around him. Another component of Dortmund’s game was their use of long diagonal passes towards Schmelzer and more specifically, the space in front of him. Their consistency and frequency of these patterns implied that this was a part of their attacking tactics as particularly through the first half they aimed many long passes into the space behind Hoffenheim’s Kaderabeck. As Reus occupied the right-back, his movements in reaction to Schmelzer’s forward runs were slightly delayed so that the Dortmund full-back had a slight head-start on his man. However due to the difficulty of these passes, they didn’t amount to much and when Schmelzer did receive the ball it was too difficult for him to fully control possession. In the last 10 minutes of the first half, we began to see some changes from the Dortmund dugout. Piszcek acting higher now with Weigl dropping into the defensive line instead. The biggest change was definitely the restructuring of the defensive line which was no longer the asymmetrical three-chain in possession and Piszczek began acting as a more orthodox full-back. In accordance to this change, we also saw Weigl dropping more frequently in order to balance the shape. In doing so, Dortmund were more able to build possession through the wings where they could make overloads more frequently through the forward movements of Piszczek. Weigl aided the build-up much better than Piszczek and between him, Bender and Subotic the ball circulation improved to some extent. Whilst Hoffenheim were happy for Dortmund to build possession in wider areas beforehand, it became slightly more difficult to defend these situations as their structure and connections around the ball were better and as a result Dortmund couldn’t be isolated as easily. Upon half-time, Tuchel made further adaptions to the initial change and turned them into a 4-3-3 as Gündogan was brought on for Kagawa. The midfielder moved to the right of the trio whilst Weigl dropped into defensive midfield and Sahin moved to the left. From this shape, Weigl would drop in a more orthodox manner whilst the individual and playmaking abilities of Gündogan were much needed in Dortmund’s possession game. Gündogan almost made an immediate impact after an individual dribble through the centre opened an opportunity for a shot which hit the post. 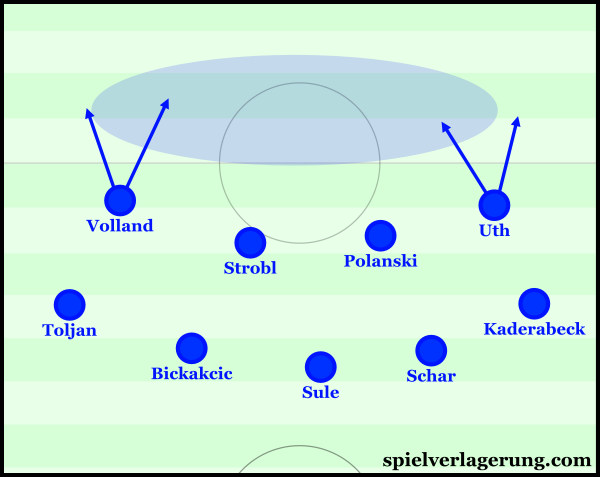 Possibly in reaction to the above changes by Dortmund, Nagelsmann made his own adaptions and Hoffenheim moved to a 5-4-1 shape at the beginning of the second half. Through doing so his team theoretically had better defence of the wider areas with a deeper wide player now able to support the full-back. When their narrow press was bypassed in the first half, they struggled to develop any access on the flanks and parts of the half-space which had the potential to be problematic. However there were some issues caused and their pressure further up the pitch weakened. Whilst the wingers were still quite active and would situationally move up to pressure the ball and support the striker, overall the forward had less support overall and they couldn’t cover Dortmund’s central access as well. I’m sure Nagelsmann will have known of this consequence before he made the change and will have accepted the trade-off as they were more stable in their midfield through a compact four which covered the spaces better. After Rudy was dismissed for a foul on Aubameyang mid-way through the second half, Hoffenheim immediately changed to a 5-4-0 formation. Out of possession they sat deeper in this shape whilst moving forward, Volland and Uth moved higher from either wing to form what was a make-shift 5-2-2 structure. Considering the numerical disadvantage, Hoffenheim weren’t really in a position to maintain the extent of their man-orientations and when defending in their 5-4-0 it seemed that they were more zonal than before. They still used man-orientations but they were much less prevalent and the midfielders were more reluctant to move further out of their position. Through doing so they aimed to cover the space in front of their penalty area and force Dortmund into wider attacks which for periods was rather successful. If they had looked to defend with more man-orientations then there would be an invitation for Dortmund to create more overloads and find a free man more easily simply due to their numerical advantage. By defending more zonally, Hoffenheim can still control the space quite well with strong compactness which worked better to negate the dismissal of Rudy. They still looked to apply some pressure to Dortmund in order to make sure they didn’t have free playmaking in front of the defensive block. This was usually done individually by one of the central midfielders who would move towards the ball whilst his teammate and near-side winger would cover. When Dortmund had the ball in the half-space, it was more likely that the pressing would be done by the ball-near winger. Hoffenheim’s attempted press from a 5-4-0. For large periods of the last 30 minutes, this change from Nagelmann worked well. With a more zonal scheme they sat in a low block and controlled the important spaces in front of their own goal and were able to coordinate a press well enough to restrict Dortmund from being able to make penetrative passes without challenge. Borussia Dortmund had the majority of the ball and early after the red card were able to create some dangerous situations. Through the use of the wide spaces and diagonal passing there were able to move the ball behind Hoffenheim’s midfield by passing around it. They could use a diagonal pass to the wide player to gain space and shift the ball horizontally whilst in reaction, Hoffenheim’s shift wasn’t sufficient as it was too slow and not very well co-ordinated with some spaces opening up. From this position they could use another diagonal pass back into the half-space to find a free player in said space which they had opened up. Although these few moments didn’t amount to anything, it suggested that Dortmund could well get back into the game after Rudy’s dismissal. However for the majority Dortmund’s game looked reminiscent of last year as they circulated the ball in a U shape for large periods, maintaining possession but having no control as they couldn’t open spaces in the Hoffenheim defence. The horizontal circulation between wings opened some gaps between the Hoffenheim players who weren’t able to cover the space as well as they had previously, but Dortmund were unable to take advantage. It took until the final 10-15 minutes of the game where Dortmund started opening up Hoffenheim more. With the away side succumbing to fatigue and Dortmund moving the ball better, they more frequently found the ball between the lines and were able to make a few break throughs through the wider areas of the pitch. Their pressure paid off and although the equaliser came from a well-worked combination from a corner, they went on to score two more from open play as Ramos and then Aubameyang completed the comeback. The result is very harsh on Hoffenheim as they played very well for the first 75 minutes of the game. Even after the red card they managed to maintain stability for large periods whilst with 11 they were clearly the better team and highlighted Dortmund’s possession issues. In Nagelsmann’s first few games at Hoffenheim he has shown some potential and the performance was certainly unlike a team struggling at the foot of the table. For the majority of the game we saw another weak performance from Dortmund who again looked slow in possession. They only really became dominant and took a control over the game once it became 11v10. These performances may be somewhat irrelevant as the Bundesliga race is practically over, whilst they will be wanting to focus their efforts on the Europa League which despite a tough draw they have a good chance of winning. Despite the league situation, the poor performances are still a worry and Tuchel has voiced his concern too, as he was particularly upset after their close win in Porto last Thursday. What’s missing in this analysis is role of Tuchels substitutions int the 74th minute. Tuchel exchanged an defensive minded midfielder (Weigl) with a striker (Ramos). Weigl was simply not needed anymore. Schmelzer dropped back and Mikhitaryan took his space on the left wing. When being fed with diagonal balls he was much more effective in turning good positional play into an actual chance.